OMG! This bike is tiny. Pull the seatpost and it’s 23″ wide, practically carry on sized. I walked it through the Farmers’ market the other day and even unfolded it went through the crowd like a greased eel. The fold is quick and simple and the frame is stiff. It’s not a touring bike, but for quick trips on crowded transit it’s way superior to the British competition. Expect to see lots of these on the London tube in future. 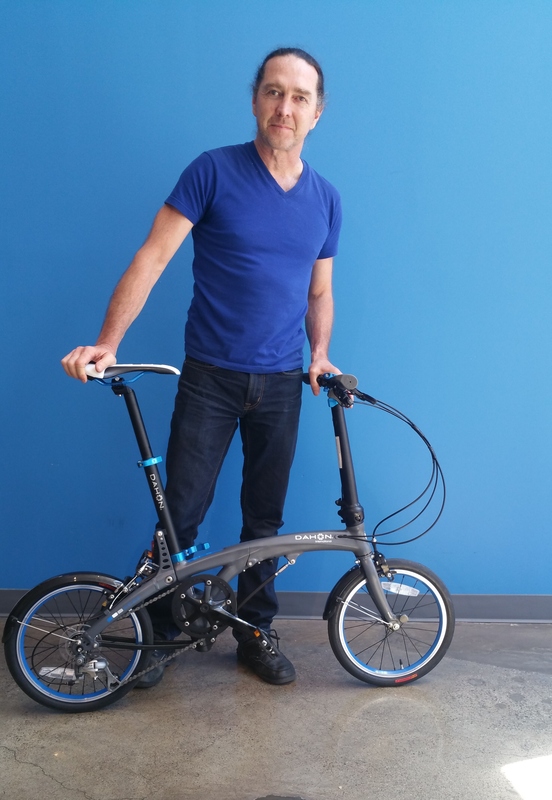 Dahon is making an extremely limited number of these bikes available in the US and we’re just about the only place to get them. Wait and you’ll lose out. You have been warned. 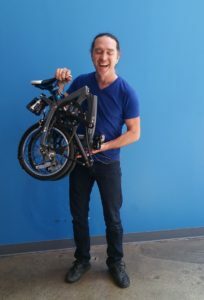 We used to assume that Brompton was the most compact folding bike on the planet. That is no longer the truth since Dahon released some folding bikes with 16-inch wheels like the Dahon EEZZ or Dahon Jifo. Today, we’re taking a look at the Dahon EEZZ D3. A high-quality bicycle in a tiny package. I got a chance to ride and fold the Dahon EEZZ extensively yesterday. It could become my favorite urban bike ever. I already knew it was small and light. But when folded it carries better than most because the balance makes it so it doesn’t bump up against your legs and you don’t have to hold it out from your body at an extreme angle. Folding has become dramatically easier in just a couple attempts. For one, it seems easier to fold with the handle bars not folded and the seat not retracted. This way the leverage that you apply from either side appears to more easily slip the magnetic clip and initiate the center fold. In addition the hinges seem to have eased up with some use. By the 3rd fold I was no longer needing to apply lateral force to slip the magnet. We’ll see if that keeps working. The gear ratios appear to be better than any 3-speed Dahon I’ve had before. Each gear is distinct and useful and top gear feels like I’m actually getting some power out of them. I also wasn’t sure how solid the frame would feel, with the vertical fold. It feels very solid so far. Curious to see if it feels any less so as it wears and loosens. Only 1 small gotcha so far. One pedal fell off when pedaling. So I discovered that I need to very clearly snap the pedals in. Other preferences, at some point I think I might be interested in adding a kickstand and swapping the tire for Big Apples. The Big Apples are hands down my favorites for 16″ wheels because they do a bit to provide stability and durability on the potholed and rail-crossed roads in SF. And, yeah, I miss the kickstand on my Curve. I know that’s not very biker-ly. But I find them very convenient when going on BART or even locking-up. Anyway, thought I would give my first impressions. I am in love with this bike. The perfect urban bike.